People always talk about wanting to live in the golden age, turn back time, escaping the present reality we live in but that’s exactly what we can do with series and movies. Technology has made us interact less with each other in reality and we are nowadays interacting more on social media and new media platforms with others, calling and sending various messages to each other. This can make us get into this bubble and with us locking ourselves into this world with almost no physical interaction if possible due to that we already got everything we need in our phones do to the evolution of convergence were a technological device provides us a variety of different tools in only one device, we almost got every possible tool we need on our phones. A funny phenomenon is that computer and the Smart TV (the new version on TV) is enables you into the new media world with Netflix, Youtube and other nice sites to explore, with the access to internet, is becoming almost like the same tool but in a different format and size. As we all know in the television shows and movies are something we are brought up with and in this era we can now watch television or movies very easy with different devices depending on what we choose to use, we don’t specifically need only the television, we can also use the phone or our computers to watch movies and TV shows. Since TV probably was the one tool that first showed us the visual movements in aspects of something and its movement we might have to break some things up to understand more. First of all, TV and movies is a one-way communication style and when the message is sent to the audience(us), we can choose to interpret it by ourselves and not give feedback to it (might be possible to do it indirectly through another medium nowadays or if it’s a live show where you get to call in and participate but remember it would still be a one-way communication style to all the others that are watching). One way communication, if used properly can help you manipulate and persuade an audience really well and no one would really be able to do anything about it since nobody really can question it and actually that’s exactly what it does -it influence us, and we can’t respond to it. Now you might wonder how, so we could just start with the word mirroring. Mirroring is social phenomenon when we imitate or mimic another person’s posture, attitude, gesture and words. The mirroring usually get unnoticed by both the person who is mirroring and being mirrored. Imitation usually is a sign of people being in sync giving them a greater connection and you usually tend to mirror people you are fond of and people start doing this very early in the childhood to learn. Examples of it could be you smiling along with another person in conversation, yawning after another person or just walk with someone taking steps with both your feets in perfect synchrony. The mirroring usually get unnoticed by both the person who is mirroring and being mirrored and it’s usually easier to persuade a person who’s in sync with you. So what if we might act as the persons on TV? Well it’s not wrong but what happens when our values starts to agree with it too? The next step that comes after the mirroring process is Herd Mentality where people to try to fit in and do what they think that everyone else is doing in the society. Examples of this could be search around for reviews and ratings when you want to buy or are interested in anything to see what others think of it. Television has affected our cultures in many ways and is a technological determinism. It has affected us a lot since it can show us pictures and emotions right at a place where somethings occuring. This has made news able to show footages on crises, terror attacks and movements that has happend in history making people feeling closer to the news. An example of this could be the social movement where African Americans was demonstrating, protesting for their civil rights where the police blasted them. The footage made viewers swayed people to like the the liberal legislation having a result of the 1964 Voting Rights Act. The 9/11 terror attacks that occured in September, 2001 became worldwide news and was striking fear into people realising that conflict wasn’t over. By having Television showing the attack, people was able to see the footage so close and that made it even more relatable. The Thai society is also very influenced by Television that’s mainly the only device older people use to access information or entertainment today. The only problem with this is just that the TV shows still displays the same type of characters (ideal girl, ideal boy, annoying and troublesome exes, the uneducated maids) with better quality and new actors and new scripts that are more adapted to the present language. Still they are very likely to use the same concept with the good getting a good life and the bad getting a bad life is still the moral of the series enhancing that having a lot of good values will make a person ending up getting happily married. When you look at the Thai culture, you’ll see that older people has an ideal ¨good peron¨ or ¨good kid¨ stereotype that has everything to do with looks, manners and values (you can read more about why the Thai’s and the soap opera obsession here.) The values has been ideal ¨Thai Behavior¨ for many decades and with the new generation’s values has started to change course. Nowdays the young people have got access to many other different types of mediums resulting in a generation being more influenced by the western culture listening to indie bands instead of the thai pop-rock that existed. Influences be American TV shows like ¨America’s Got Talent¨ becomes ‘Thailand’s Got Talent¨ and ¨The Voice¨ becomes ¨The Voice Thailand.¨The new generation starts to explore the internet and new mediums gets introduced to us. The new generation starts to develop more values and sees how others live all over the world and with the access to social platforms like Netflix, Youtube, Instagram, Facebook, Twitter and other news sites and influencers, we start to question our own values. But to the old people, the only thing that exists to entertain them and let them know more about the news of the world is Television. This creates a big gap between the both generation clash a bit since the young, more opened generation has a more openminded and different minset and values. According to a survey in the US, one of the most powerful countries in the world watch more TV than we spend time at school, even though the numbers have shrunk some from before, but by seeing this diagram, you might be able to do the math by yourself if you think about how many hours it is. If we now then were to take a look at a TV show that you like and then letting you sit and watch it season after season, building up this feeling of having a connection between you and the shows characters, it wouldn’t really be so weird if we started to mirroring the people’s behavior in it if we watch it all the time. Nobody can really blame us directly since it’s a one-way communication, the TV won’t notice our response to it. According to studies, our behavior seems to be shaped from TV and movies too. On the contrary, Science Daily posted a journal study that showed if you were to watch TV shows like ‘Mad Men’ and ‘Two and a Half Men’ you were more likely to cheat and being less committed in to the marriage just like in the series. Violence on TV exposed to children also tends to have an effect becoming long-term imaginary influences that makes you more violent over time as a person. According to Media Partners Asia, the country with the largest TV market in 2013 was Thailand. This means that over half of the people who browse and are usuing the internet are watching online videos everyday, and when they do it it’s an average on 4 hours per day! 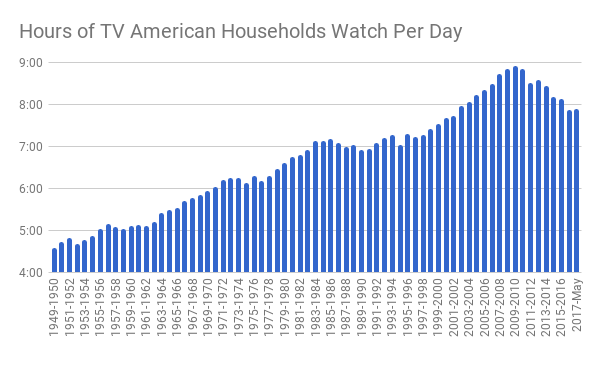 And according to Nielsen TV Audience Measurement, from 2014 the average hour to watch movie per day was 4 hours, 2 minutes and has rised up to 4 hours, 10 minutes in 2017. The results shows that even that the Thai’s has started to use mobile devices, they still watch a lot of TV, movies and videos and it’s not dying. And then you might wonder why is this is so important to know? Well it’s believed that what happens on the TV influence us. Researches has shown that TV shows and movies can change the way we think of love depending on what we see on television. For example from a research of University of Michigan if we watch more romantic movies we’re to believe that eventually ‘love finds a way and can overcome all the obstacles’ since the movies gives you an implication of long lasting relationships. The Television is not dying, it’s just developing to a new form and it know how marketing works. But don’t think that the television people only stops here. No, TV series and the new media sources we have today are so smart to get to us to promote trailers and different types of content to stay in our feeds adjusted for the best suitable medium. By doing this, you’ll see the promotings everywhere always having it in sight. Some marketing strategies that are very effective on Social Media is transmedia and crossmedia. A phenomenon and brilliant technique marketing for series is for example a strategy called the transmedia storytelling, -a technique where there are multiple different stories about one story world that gets promoted on different mediums. An example of this could be Netflix promoting series through different channels or in different ways. The serie started the promoting by collaborating with Twitch, making a four-hour livestream broadcast with people having strange things happening to them giving people a change to also vote about what could happen, ending with airing the first episode of Stranger Things, showing it for 8 minutes giving the fans wondering why introducing the lost boys(the Buyers) house. After the show had aired for a few weeks, a 360 degrees VR video was released on Youtube continuing to show the first floor of the Buyers house with some surprises. They also made a game on app store and google to promote season 2 which was called Stranger Things: The Game, which fortunately, also was for free. Due to the serie becoming such a hit, people on the internet started to get engaged talk about it with its great story and content that even Stephen King, the famous writer who even influenced the serie, have even tweeted about it, multiple times. Apart from this other people tweeted about it too, giving good reviews which lead to a mouth-to-mouth effect on the internet. That is something we all know is the best advertising of any kind. This has led to Stranger Things getting the highest fan growth for a new TV show (4.35 million) which is really great. The movie world has also made some developments with cross media storytelling. Trailers, for example when promoting a movie, they get posted on different mediums. Today you don’t only see the trailers at the cinema but also on Youtube, Twitter, Instagram and Facebook among others use the different mediums to promote shows and movies. This is important to be aware of. We have to stay on our guards so TV shows and movies suddenly don’t change it course and biase or manipulate us in any way. We would end up in a society were we get approached by it everywhere and probably be brainwashed by now. Think of this, if it influences us today, how much will it influence us in the next 10 years? Well, that can only the future hold.